Is Tim Bradley regretting re-signing with Top Rank? By Robert Elmore: In boxing, there are no guarantees. One has to make sure they get the best possible deal for themselves and their family that will secure their future. Decisions will not always be popular among boxing fans and Tim Bradley’s resigning to Top Rank was received with mix emotions. Bradley was a free agent by the end of 2014 the boxing world was his oyster. He was the WBO champ having beaten Manny Pacquiao (controversial or not), made 1.05 million against Joel Casamayor and 5 million against Pacquiao. Many boxing fans (including myself) thought he would test the free agent market or join Al Haymon’s army. Bradley, however, decided to an extension with Top Rank. One of the sticking points, although denied by Bradley, was securing a rematch Manny Pacquiao. But let’s look at this from Bradley’s and the fans. Bradley’s extension came with guaranteed minimums and that was very big for him. Anything else that was negotiated (ticket sales, gate money etc.) would be extra. After the signing the extension, he made 4.1 million against Juan Manuel Marquez, 2 million against Diego Chaves and 5 million in his rematch with Pacquiao. Bradley was reportedly guaranteed 10 million dollars in his rematch Pacquiao that was written into the contract before their first fight and ended up settling for 6 million. Fast forward to today, a match with IBF welterweight champ Kell Brook was talked about, but scraped. Bradley reportedly turned down a fight with Brandon Rios. Bradley seems to be in a place where he wants bigger fights and bigger money. His resume is pretty stellar considering the fact that he’s not that big of an attraction. From some fans standpoint, signing the extension was not worth it. He got the ONE big fight with Pac, he did alright in pay per view bout with Marquez (375,000 buys), and is now the WBO champ again. But the problem has no other opponent that will bring in the money he is looking for and his fights have been against Top Rank opponents. Bradley is supposed to defend his title against mandatory challenger Sadam Ali (promoted by Golden Boy), but nothing has come of that yet. What is also interesting to note is that Top Rank and Golden Boy was supposed to be uniting to break big fights to the fans. The only problem with that is neither stable is deep with big names; especially welterweights. Arum even toyed with the idea of putting Bradley against Saul “Canelo” Alvarez and middleweight king Gennady Golovkin. To me that was all smoke and mirrors. Many fans believed he should have signed up with manager/advisor Al Haymon. I strongly believe that Bradley feels that while he might have faced Keith Thurman, Danny Garcia or even Robert Guerrero, the financial rewards would not be there. I agree. The most he could have done was work on a fight by fight basis. He has been wanting is a crack at pound for pound for pound king Floyd Mayweather Jr. for the longest. He expressed he didn’t know if he would get to Floyd or not if he had not resigned with Top Rank. While that does not seem far-fetched, there was no guarantee that he would have gotten the Pacquiao rematch had he not signed the extension either. So what is going to come from all this for Bradley? Who knows. He’s been in enough “I’m trying to prove something” matches and now wants to the pay days to match. Hopefully, he gets what he wants. 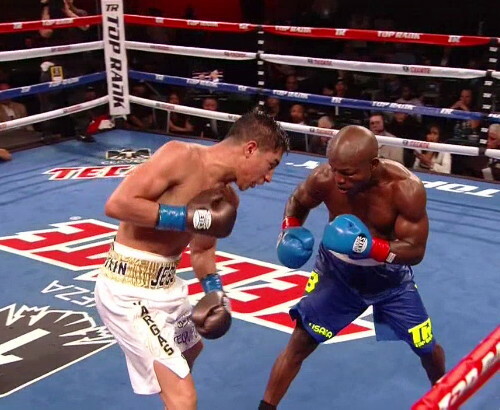 Boxing » Timothy Bradley » Is Tim Bradley regretting re-signing with Top Rank?